Purchase a Uniflame Spark Guard and protect your family from fireplace accidents all year long. The Uniflame S-1127 is a Single Panel Spark Guard in Uniflame's Small Size. This particular spark guard measures a spacious 41 inches in total width, for complete coverage without blocking out the ambiance of the fire inside. Although the small spark guard is a great size, this model is also available in medium and large sizes, which are sold separately. Not only will this guard keep you safe, it looks great too, and is sure to blend nicely with all types of home decor styles. Per the manufacturer, the legs stick out 4.5". Is this screen meant to sit INSIDE the fireplace or against the front of the fireplace? Like all of our freestanding fireplace screens, this screen is designed to sit flush against the fireplace opening on the hearth. The two feet located on the front of this screen project outward and onto the hearth and two, smaller feet located on the backside of the screen and positioned near the center of the screen will project into the hearth for leveling. What is the depth of this Uniflame S-1127 single panel black wrought iron sparkguard? Per the manufacturer, the depth of this screen is 1 inch. Are the feet in the front and back? The screen assembly has small leveling feet that are set inward at the base of the screen, but they do not project into the room, as is the case with the outer feet. Is this sparkguard OK to use outdoors? I would not recommend using this product outdoors without first coating it in a layer of high temperature fireplace paint. This will prevent the screen from corroding over time. 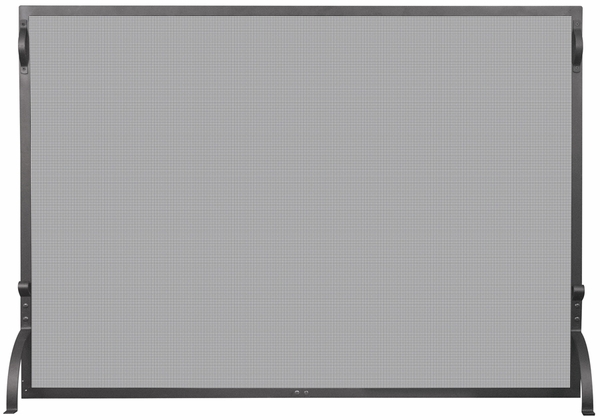 Per the manufacturer, the height of the screen is 31.5 inches, with a depth of one inch. Are the given dimensions for the screen or for the entire unit? The dimensions listed on this page pertain to the entire unit. found this store online and had never heard of it or their products, but the price was right and after speaking to a customer service rep I decided it was legitimate and I made the purchase. The products arrived within three days, nicely packaged and very, very easy for a lady to assemble. The representative was friendly and helpful and I am very, very pleased with the product and ease of ordering. Perfect Screen for my Small Fireplace! This is an unadorned smaller screen that is the perfect fit for my small fireplace. It was so easy to find the right screen - just popped in my dimensions and there it was! Sturdy construction - not at all flimsy or "wobbly". Assembly was a breeze. Shipping was timely. I'm sure it will serve me well for many years. This screen fits perfectly in our fireplace. It is simple and a perfect complement to our big stone fireplace. Very pleased with the fast shipment, the easy assembly, and the attractive design! This is a very basic and practical screen and doesnt detract from the beauty of your fireplace. It is solidly built and easy to put together. Pay attention to the measurements of this screen to make sure it will fit well on your hearth. It is suitably heavy, so it won't be accidentally tipped. I am very pleased with its appearance and protection. We have received many complements after buying this screen for our outdoor fireplace. The simple design doesnt overpower our beautiful fireplace and it works great to keep everyone safe from popping sparks. This flat screen makes it easy to see the fireplace from any direction. It also allows you to sit very near the fire when its warmth is needed. It is simple to move aside to get access to the fireplace. There were no problems putting it together, and I had it set up very quickly. I wish I had purchased it sooner. This screen definitely has my recommendation. Our lake home has a large stone fireplace, and we bought this screen to go in front of it. It fits our fireplace well, but it looks as if it would be a good size for a variety of fireplace designs. It is very stable and appropriately heavy, especially for its inexpensive cost. We are pleased with its appearance and performance. This screen is not exceptionally sturdy, but it will probably do the job. The mesh does not reach all the way to the edges in some areas. The included screws are too small for the holes and do not match the screen well. In fact, one of the screws for the feet did not even reach all the way to the frame. I ended up purchasing bigger screws and spray-painting them to match the screen. I did have to attach the feet to the screen, but it was an easy process. It has a modern, clean design that is exactly what I wanted. It is also priced very competitively. When I received this product, some of the screws necessary for assembly were missing. Other than that, it is a good screen, both in looks and usefulness. A nice design and a great buy for the money! Not expensive at all. Though there were a few flaws with the screen, you didnt notice them once the screen was in place. I made the decision to purchase this product for my daughter to use with her fireplace. I am quite satisfied with the results. After all, why spend more when you can get great quality for less? Im so glad to be able to burn wood in my fireplace again. This screen is the perfect size for my fireplace. Its heavy, so it keeps the hearth area safe, and the attractive design looks like it costs more than it does. This screen has a very simple and plain design that does a great job of showing off the crackling fire. It was delivered quite quickly and is an exact fit for my fireplace opening. We were very pleased with how fast this shipped and how easy it was to put together. It does a great job to keep sparks from flying out as it sits very close to the fireplace wall. The product description was spot on! You dont need extra ornamentation when the lustrous ebony finish turns a minimalist fireplace screen into a thing of beauty. It frames the fireplace opening perfectly and provides complete safety from sparks, while allowing the fire to be seen in all its glory. Based on the reviews that I read, I expected the screen to be of good quality, but the product itself is even better than I had hoped. It has a snug fit against my fireplace and is very solid and durable. It allows an excellent view of my burning fire, yet it has an attractive appearance that goes well with the room. Safety was the key reason I purchased this screen as our gas fireplace insert gets very hot. I also like the attractive design and am pleased by the quality workmanship. Well worth the cost. This product is really well constructed for its price. I've actually seen the screen advertised elsewhere at a significantly higher cost. I highly recommend it. The simple design of this screen really puts my fireplace on display. It has a quality construction and attractive appearance. There is no sense in paying for a more expensive screen when this one is so strong and has such a clean appearance. I am confident it will protect my children from the hazards of the fireplace. I cant say enough about this screen. Its a fantastic product. The quality workmanship is superb, it keeps sparks from escaping (compared to other screens that dont sit close enough), and the attractive design totally transforms our fireplace into a thing of beauty. We love it! You wont regret purchasing one. Its a great deal for your pocketbook. I really like the attractive design, the quality of the screen mesh and how it keeps nasty sparks from escaping from the fireplace. Personally, I believe that we found an unbeatable deal in this product. It is not only extremely cost effective but also is able to seamlessly fit into my home with the greatest of subtlety. This screen is very nice looking in front of a burning fire. I have had some issues with the feet becoming loose. They retighten easily, but it is a recurring annoyance. We restored our fireplace back to its original look by removing the wood burning insert, and this screen works great to keep sparks from flying out. Its a very good design and very durable. This fireplace screen has a flat design, is simple to put together, and is priced inexpensively. Unfortunately, the quality seems to match the price. The welding of the mesh and the frame is not done well at all and actually seems to be rather randomly spaced. As a result, there are some parts of the mesh that are not actually attached to the frame. The screen is quite sturdy and looks fine at a quick glance. A closer look, however, will reveal its imperfections. It will do the job all right, but it won't earn you many compliments. I was disappointed in the cost and options available at local retailers. This screen is just what I wanted at a price I can afford, and it was delivered very promptly. The density of the screen mesh does a great job stopping sparks plus the design is simple, yet attractive, and doesnt call attention to itself. This was a great purchase. We love how it hugs the fireplace surround and the simple design complements our fireplace fade. The legs and handles were easily attached. My fireplace does not have a hearth or a mantle. It has gas logs with fake stones to provide the look of coals. My kitten loved playing with the stones and would scatter them around while I was at work. This flat screen looks great with my fireplace and now my kitten can't play with the stones. I am very pleased. This screen looks just as its website promised. I am pleased with the item. Although I have seen this kind of fireplace screen at high-end retailers, I did not want to pay their prices. This inexpensive version is just as nice as those I had seen. It was very easy to put together and looks great by my fireplace. I have gotten lots of positive comments about it. My fireplace is in a rather small room, so I wanted a flat screen that would not occupy additional space. This screen does the job perfectly. I also have a distinct drop from the floor of the fireplace to the hearth. To offset this, I actually installed the screen's support brackets upside down. Thanks to this maneuver, the screen sits at an angle on a level surface, but sits nearly even on the raised fireplace. I had a little trouble with assembly when I tried to put on the stabilizing feet. I eventually succeeded, and they seem to be fine now. I have also noticed a number of imperfections in the mesh of the screen. They would not be noticed in a cursory glance, but they are present nonetheless. We have a large decorative screen that looks great but does not prevent access to the fireplace. With a new puppy, I needed something to go behind it until I can train him to stay away from the fire. The size and design of the screen were fine, but the mesh has several holes in it. I am not pleased with it, but it is too much trouble to return it. I am very happy with the screen, but I was disappointed with the parts supplied for its assembly. The screws are really too small for the size of the holes and would have not held it together well. I was forced to purchase other hardware that fit the product better. I also noticed that in some areas the holes were covered by the border of the screen. I had to do a little bending to make things fit together properly. You may also be interested to know that there is a small third leg in the center of the screen. I did not see it in the pictures or online description, so I was pleasantly surprised. After I got it successfully assembled, I have been very pleased. When I saw the price of this screen, I really expected it to be poorly made. In fact, I ordered it thinking that I might very well have to return it. Thankfully, I was pleasantly surprised when the product arrived. It was safely wrapped and packaged and easy to assemble. Once in place, I am quite pleased with its appearance and its quality. What a wonderful, well-made screen that perfectly suits our fireplace with its simple and modern design. We are very pleased with the purchase price and how easy it was to put together. I just got my fireplace into working order and needed something to provide protection from the open flames. This screen does a great job at a great price. I really like how clean and simple this screen looks. I did not expect it to be so sturdy and durable. This is a good looking and easy to assemble screen for the price. We are very, very pleased and extremely happy that this product turned out so well. Its very attractive. Couldnt be happier! The assembly of this item is basically an easy process, except for one problem -- the holes to attach the left leg did not line up properly. Other than this issue, the screen is perfect for my needs. It looks good and seems quite sturdy. I did a good bit of looking before I decided to purchase this screen. I actually expected it to be rather poor quality based on its cost, so I planned to use it only occasionally. To my surprise it is quite sturdy and heavy. It is nice enough to use regularly and is an incredibly good product for the cost. I spent a long time shopping for the perfect fireplace screen, but finding this item made my search worth the work. It is durable but not pricey, arrived promptly, and was quickly assembled. This screen was delivered very quickly and putting it together was also a fast process. It has a nice tight mesh that protects well from flying sparks. It is also a good match for the size of my fireplace.